As reported in an earlier blog post (5th July 2010), the Financial Reporting Council (FRC) issued the UK Stewardship Code in the summer of 2010 with the aim of enhancing ‘the quality of engagement between institutional investors and companies to help improve long-term returns to shareholders and the efficient exercise of governance responsibilities’. To what extent have asset managers, asset owners and service providers complied with the recommendations of the Stewardship Code? Several reports have been produced which detail the level of compliance. The FairPensions (2010) survey analysed 29 of the largest asset managers and found that 24 of these had published a formal statement/response with respect to the Stewardship Code. An additional four (Insight, Invesco, Morgan Stanley and State Street) had posted short statements on their website referring to the Code. FairPensions reviewed the 24 compliance statements to assess the quality of disclosures made with respect to the Code. “Over 90% of major institutional investors now vote all or the great majority of their shares in UK companies; nearly two thirds now publish their voting records. At the time the survey was conducted, 43 out of 50 respondents had published a statement on adherence to the Code, and another six did so subsequently. The FRC (2011) published Developments in Corporate Governance 2011, The Impact and Implementation of the UK Corporate Governance and Stewardship Codes, FRC, London. They reported that, as of December 2011 the Stewardship Code had attracted 234 signatories, including 175 asset managers, 48 asset owners and 12 service providers23. This level of take-up indicates that the concept of stewardship is being taken seriously. Importantly there has been a wide base of support for the Stewardship Code including from both large and small institutional investors. There seems to be rather mixed evidence as to whether institutional shareholders are engaging more with their investee companies since the Stewardship Code was introduced. However over time it is to be expected that overall there will be a higher level of engagement. Organisations not complying with the Stewardship Code tend to fall into two groups: (i) those not signing based on their specific investment strategy, and (ii) those who do not commit to codes in individual jurisdictions. Areas where the FRC might consider strengthening the language include conflicts of interest, collective engagement, and the use of proxy voting agencies, and possibly a recommendation that investors disclose their policy on stock lending. Finally a Stewardship Working Party has been formed consisting of Aviva Investors, BlackRock, Governance for Owners, Railpen Investments, Ram Trust and USS together with Tomorrow’s Company. They will determine whether it is possible to devise a “scale of stewardship” which would enable institutions to differentiate themselves. The Financial Reporting Council (FRC) has issued the UK Stewardship Code which ‘aims to enhance the quality of engagement between institutional investors and companies to help improve long-term returns to shareholders and the efficient exercise of governance responsibilities’. The UK Corporate Governance Code has traditionally emphasised the value of a constructive dialogue between institutional shareholders and companies based on a ‘mutual understanding of objectives’. Now, in the Stewardship Code, the FRC sets out the good practice on engagement with investee companies which it believes institutional shareholders should aspire to. Kate Burgess and Miles Johnson in their article ‘FRC’s blueprint for investor engagement’ (FT, page 18, 2nd July 2010) describe the Stewardship Code as ‘the first of its type in the world and designed to sit side by side with the UK’s code on corporate governance recently reworked by the FRC’. In November 2009, the ISC issued the ‘Code on the Responsibilities of Institutional Investors’. The ISC stated that ‘the Code aims to enhance the quality of the dialogue of institutional investors with companies to help improve long-term returns to shareholders, reduce the risk of catastrophic outcomes due to bad strategic decisions, and help with the efficient exercise of governance responsibilities’ and ‘the Code sets out best practice for institutional investors that choose to engage with the companies in which they invest. The Code does not constitute an obligation to micro-manage the affairs of investee companies or preclude a decision to sell a holding, where this is considered the most effective response to concerns’. Following a consultation earlier this year, the FRC assumed responsibility for the oversight of the Stewardship Code. The ISC Code discussed above contained seven principles which now form the basis for the Stewardship Code and indeed the Principles were adopted with only minor amendments. The minor amendments relate to Principle 3 about the monitoring of companies. In the Stewardship Code, institutional investors are encouraged to meet the chairman of investee companies, and other board members as appropriate, as part of the ongoing monitoring, and not only when they have concerns; attend, where appropriate and practicable, the general meetings of companies in which they have a major holding; and give careful consideration the any explanations given by investee companies for departures from the UK Corporate Governance Code, advising the company where they do not accept its stance. The Stewardship Code is to be applied on a ‘comply or explain’ basis. The UK Stewardship Code is ‘addressed in the first instance to firms who manage assets on behalf of institutional shareholders such as pension funds, insurance companies, investment trusts, and other collective vehicles’. The FRC expects such firms to disclose on their websites how they have applied the Stewardship Code or to explain why it has not been complied with. However it has been pointed out that it is not the responsibility of fund managers alone to monitor company performance ‘as pension fund trustees and other owners can also do so either directly or indirectly through the mandates given to fund managers’. Therefore the FRC encourages all institutional investors to report whether, and how, they have complied with the Stewardship Code. The FRC plans to list on its website all investors who have published a statement indicating the extent to which they have complied with the Stewardship Code. This list will be made available from October 2010. Monitoring and review of the application of the Stewardship Code will be in two phases. As an interim measure, the Investment Management Association (IMA), will carry out its regular engagement survey which will also cover adherence to the Stewardship Code in 2010. The first full monitoring exercise will then take place in the second half of 2011. The FRC points out that there are a number of significant issues which were raised during the consultation phase which are not addressed in the UK Stewardship Code. These include disclosure by institutional investors of their policies in relation to stock lending; arrangements for voting pooled funds; and the information to be disclosed in relation to voting records. The FRC will undertake additional work in relation to these areas prior to the monitoring exercise in 2011. It is apposite to conclude with a comment from Bob Campion in his article ‘Managers on alert to comply or explain’ (FTfm Page 5, 5th July 2010) ‘The new code is a timely opportunity for pension trustees to finally get to grips with their role as institutional shareholders. If they do, it will be up to fund managers to demonstrate their own expertise in this area or risk losing business’. It is widely recognised that corporate scandals and collapses often occur when there is a single powerful individual in control of a company. This is exacerbated when there is a lack of independent non-executive directors on the board. 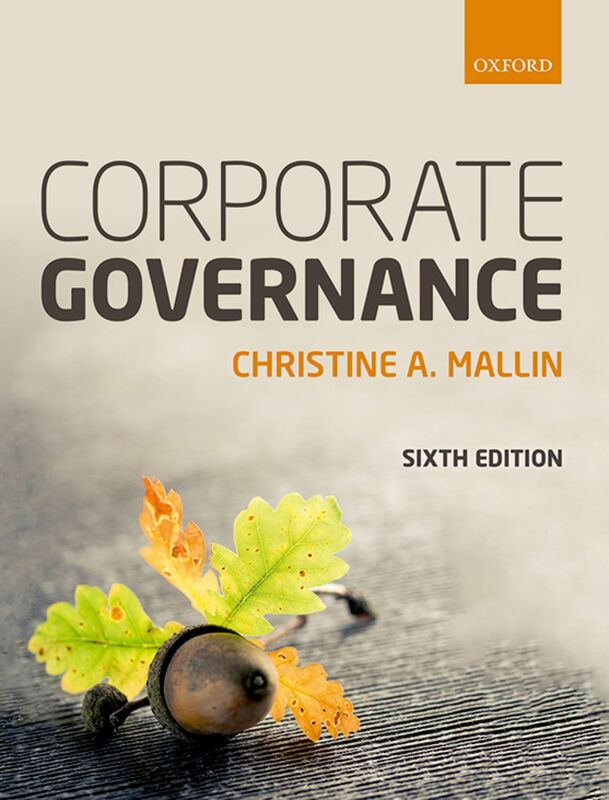 Therefore it seems axiomatic that powerful individuals can be constrained, and the temptations they may face conquered, by having in place a sound corporate governance structure achieved through dividing the roles of Chair and CEO. Whilst combining the roles of Chair and CEO is rare in the UK’s largest companies, Marks and Spencer PLC is a notable exception. In May 2004 Sir Stuart Rose was appointed to the position of Chief Executive and subsequently in 2008 he became both chairman and CEO until July 2011. This combination of roles goes against the Combined Code’s recommendations of best practice. As a result in 2008 some 22 per cent of the shareholders did not support the appointment of Sir Stuart Rose as chairman. Nonetheless he remains in the combined role although there is still considerable shareholder unrest and 2009 has seen more dissent by shareholders on this issue. In the US, the roles of Chair and CEO have often been combined but now more and more companies are appointing separate individuals to the two roles. A recent example of a US company which has decided to appoint an independent chairman is Sara Lee, the famous producer of gateaux, beverages and body care products. Sara Lee has decided to make this change as a response to investor pressure and also the growing trend in the US to split the two roles. Kate Burgess (FT Page 27, 9th October 09) in her article ‘Sara Lee to separate executive roles’ explores this case in more detail. In the UK there has long been pressure brought to bear by institutional investors on companies which have tried to combine these roles. This pressure, together with the long history in UK corporate governance codes against the combination of roles, means that few large companies seek to combine the roles (although as noted above, Marks and Spencer plc is an exception). Recently Norges Bank Investment Management (NBIM), a separate part of the Norwegian central bank (Norges Bank) and responsible for investing the international assets of the Norwegian Government Pension Fund, has started a campaign to convince US companies to split the roles of Chair and CEO and appoint independent chairmen. Kate Burgess (FTfm Page 10, 12th October 09) in her article ‘Norwegian fund steps up campaign’ highlights how NBIM has submitted resolutions to four US companies calling on them to appoint independent chairmen. The four companies are Harris Corporation, Parker Hannifin, Cardinal Health Inc, and Clorox. In addition NBIM has also voted against combined Chair/CEOs at some 700 US companies. Interestingly Sara Lee had also been the focus of action by NBIM before agreeing to appoint separate individuals to the roles in future. Also in Kate Burgess’ article, Nell Minow of The Corporate Library http://www.thecorporatelibrary.com/ states ‘NBIM can leverage a lot of shareholder frustration and a widespread sense that this is a sensible, meaningful but not disruptive initiative’. It seems to be only a matter of time before the vast majority of companies will split the roles of Chair and CEO. Of course the individuals appointed to those roles must be both capable of fulfilling the tasks expected of them, and of ensuring that ultimately the two roles, carried out by separate individuals, unite the company under a common leadership approach. That may prove more difficult than many imagine and so the appointments process must consider fully the many traits needed to ensure success. Signatories to the PRI commit to incorporating ESG issues into investment analysis and decision-making processes; being active owners and incorporating ESG issues into ownership policies and practice; seeking appropriate disclosure on ESG issues by the entities in which they invest; promoting acceptance and implementation of the Principles within the investment industry; working together to enhance their effectiveness in implementing the Principles and reporting on their activities and progress towards implementing the Principles. One of the questions on the annual Reporting and Assessment survey asks respondents to rank the six principles on the level of difficulty of implementation of the principles. There are currently 574 signatories to the Principles, comprising 183 asset owners, 282 investment managers, and 109 professional service partners. Aviva Investors is one of the signatories and their Head of Research and Engagement, Steve Waygood is quoted as saying: “There is now a critical mass of institutional investors who believe management of corporate responsibility or ESG issues is highly relevant to the long-term financial success of their investments”. The UN PRI recently delisted five of its signatories after they failed to report on their activities. Sophia Grene (FTfm Page 6, 24th August 09) in her article ‘UN Principles need sharper teeth’ states ‘it is a significant step forward for the UNPRI to demonstrate there are consequences to treating the principles as nothing but a brand-enhancer’. The UN PRI have taken some clear steps to hold its members (signatories) to account. The UN PRI are also working on a transparency framework which, according to Grene, will give ‘clients, customers, members and other stakeholders…a clear sense of their responsible investment processes, activities and capabilities’. It will be interesting to see how the UN PRI evolve over time given the growing interest in this area.